These knitted slippers look small when they are not on a foot, so I took a picture of a slipper being worn. They are naturally stretchy. The pattern provides instructions for small, medium and large sizes, but you can also adjust the pattern further to accomodate other sizes. We also have a pattern for Crocheted Moccasin Slippers, again in a variety of sizes. Yarn: Use two strands of 4 ply worsted weight yarn. I’m not sure how much it takes as I bought 170 g skeins and had plenty of yarn leftover. I knit these slippers in two colors. Black for the sole and light blue for the rest of the slipper. You can make them all one color if you want. Needles: Two 5mm needles. I used circular needles as I find them easier to work with. I used them the same way I would use the two long 5mm needles. But if you prefer using the two long needles, by all means do so. SIZE: These will fit a foot of 9 1/2 inches. For every 1/2 inch larger add 4 stitches when you cast on. For every 1/2 inch smaller subtract 4 stitches when you cast on. I will have notes in blue on the pattern for where to add or subtract stitches for the different sizes. It will be listed as (S, L) – meaning Small size which is 1/2 inch smaller and L meaning 1/2 inch larger. For even smaller and larger sizes, just add or subtract sts from those sizes. Please note: I have not tried to make these in different sizes. I am only going by my gauge, I think it should work out. This pattern is worked in rows. When completed you will sew up the sole and the back of heel seam. Important: The slippers are folded in half lengthwise when you are finished, so that is why the sole seems big at the start. Just continue working the pattern and when you get to the “Sides and Top”, you will notice it taking shape and see where you sew the bottom seam and back of heel seam. Change colors here if you are using two colors. Cast off. Sew up seams. 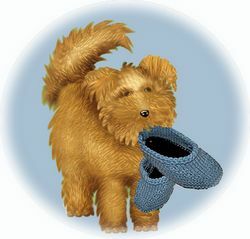 Contributed by Sue’s Crochet and Knitting site, which offers Free Crochet and Knit Patterns, Craft Supplies and more. I hope that will be helpful for you!